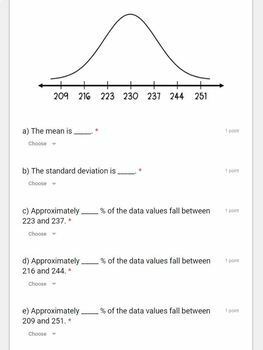 This 18-question, self-grading assignment provides students with practice applying the concepts of mean, standard deviation, and the empirical rule. 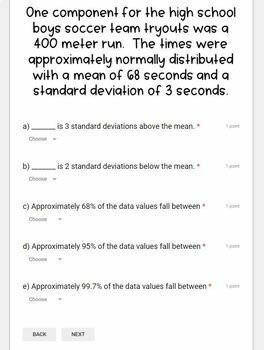 Students will be asked to approximate/ calculate percentages of data values, given the mean and the standard deviation. 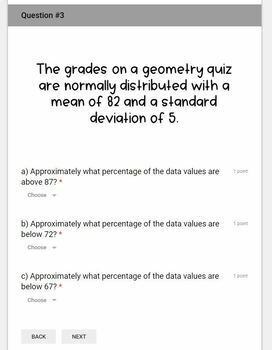 I have also included a hard copy of the assignment which includes the exact same questions as the Google Form. This helps with organization and accountability. 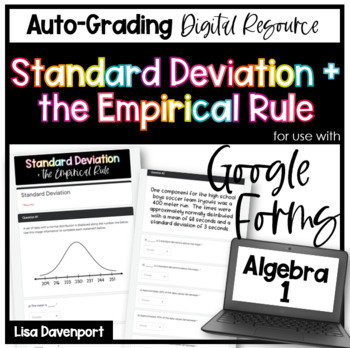 You will receive a link & directions to access a copy of the google form. Once copied, it is yours to edit. The entire form is editable with the exception of images I have uploaded. You are always free to delete/ add/ change anything on the form! I have the form set to collect email addresses but if your students don't have email addresses you can easily turn that feature off. Please note: This assignment was written to meet the high school algebra 1 statistics standards.